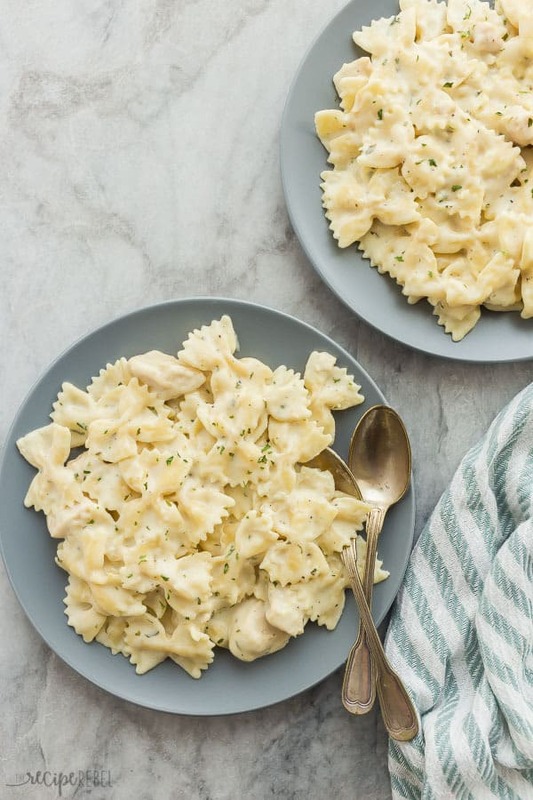 This Instant Pot Chicken Alfredo Pasta is an easy, one pot meal that cooks in record time! It’s creamy, comforting and hearty! Hey everyone! It’s Ashley here from The Recipe Rebel back with another Instant Pot recipe, because September is crazy enough without us having to worry about getting a good meal on the table in between after school activities, lessons and sports! I was a little nervous about making pasta in my Instant Pot for the first time, because I thought it would either all clump together (how could it not when there’s no stirring?? ), or be totally mushy and overcooked. But somehow, it just works. And it works so well, especially when you have your hands full with littles or other things because once you close the lid and set the cook time, it’s totally hands off. You can’t fuss over it even if you wanted to! This is one of our go-to recipes because it’s easy, the kids love it, and the leftovers are perfect for lunches the next day (if there are any!). If you’re looking for more Instant Pot pasta recipes, try this Instant Pot Baked Ziti or this Instant Pot Mac and Cheese! 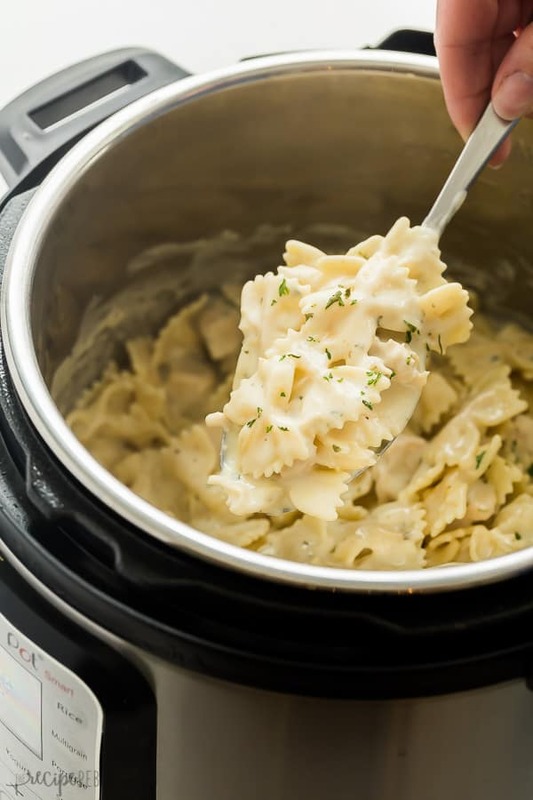 You never want to milk, cream, cheese or other dairy products to the Instant Pot before pressurizing. They will clump and foam when you open the valve to release the pressure. You don’t want to try it. The worst thing you can do is cook the pasta too long. You will want to cook the pasta for roughly half the time listed on package, especially because in this recipe, you are going to turn the Instant Pot to saute when you add the rest of your sauce ingredients. If your pasta is well cooked to begin with, it’s going to turn into a gross mess when you’re cooking and stirring the sauce. Feel free to use chicken breasts or chicken thighs, or you can even skip the chicken and opt for a vegetarian meal. You cannot skip sauteeing the chicken in this recipe because the chicken needs a longer cook time than the pasta. Feel free to mix up the flavors by adding in different veggies when you mix up the rest of the sauce: broccoli, mushrooms, green beans, or anything that can cook fairly quickly are great. Turn the Instant Pot to saute. When it reads “hot” add the oil. Add the chicken breasts, sprinkle with salt and pepper, and brown on both sides, about 3-4 minutes total. Add the garlic, parsley and oregano and stir and cook 1 minute. Add the chicken broth, and scrape the bottom of the pot with a hard metal spoon to remove any stuck on bits. Turn the Instant Pot off. Add the pasta — don’t stir — and press down with a spatula into the liquid. The liquid will just barely cover the pasta. Put the lid on, turn the valve to sealing, and select Manual or Pressure Cook for 3 minutes. When the cook time is over, do a quick release (open the valve all the way) and remove the lid. Turn the Instant Pot to saute. 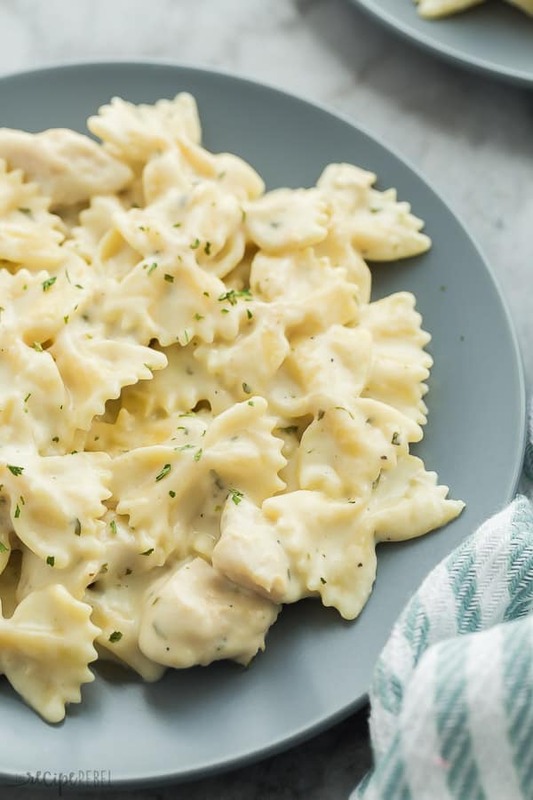 Stir in the cream cheese, mozzarella, and Parmesan. Stir together the water and corn starch and stir into the pasta. Cook and stir until thickened and season to your tastes. Serve.